Leduc County Mayor John Whaley (seen here speaking at a recent Beaumont annexation meeting) has his sights set on becoming the M.P. for the newly created federal riding that encompasses portions of Leduc County, Edmonton, and Wetaskiwin County. 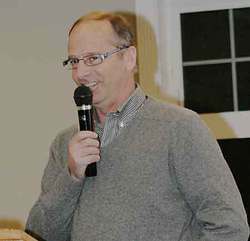 Leduc County Mayor John Whaley is hoping that his many years of experience in politics will stand him in good stead as he prepares to try and make the jump from municipal politics into the federal arena. Recently declaring his intentions to become the PC candidate for the new federal riding that will encompass parts of south Edmonton, Leduc County and Wetaskiwin County, John feels the time is right to make this transition. "Opportunities come along at certain times in people's lives and with my 14 years of experience on Leduc County Council I feel I understand the needs of both rural and urban people and could best represent all the residents as their M.P. in the new riding," stated John. Along with his fourteen years of experience on Council John has also spent seven of those years as internally elected Mayor/Reeve of the County. "After a certain number of years as Mayor people start asking those questions; if you are looking to move higher," said John. "After a lot of years in the same position I feel you should start looking for new challenges before you get stale. I don't want to overstay my welcome!" he joked. Even though he never planned to get into politics, and for most of his life ran a commercial farm in Leduc County, a passion for politics runs strong in John's family. His father, John Whaley senior, was a County Councillor in England. "Being a County Councillor in England is very different from here in Canada," shared John, "But maybe it's something than runs in my blood." With the federal government restructuring the ridings around Alberta in order to better represent the population growth in certain areas, they have created six new ridings around the Province, one of which is the one John is setting his sights on. However, he does face some challenges before he can get there. Prior to throwing his hat into the ring as one of probably several candidates vying for the MP position, he must first win the P.C. nomination to become their candidate. "It is expected that in the near future a federal election date will be called for sometime next year which means the different parties will be holding elections this year to determine their candidates," said John. "At that point in time I will try to become the PC candidate for this area." In essence, John actually has to win two elections to become the MP for this area. "In order to become the PC candidate I have to win the party vote and only people who are registered as members with the PC party can vote in that first election. So I hope that people from this area are willing to buy the $15.00 membership and exercise that right to vote for me!" John said with a smile. In running for the MP position, John is focusing his platform toward fiscal responsibility and municipal cooperation. "We've got to spend responsibly," he states unequivocally. "I would like to work toward improving the Building Canada Fund in order to promote the sustainability of all Canadian municipalities, and I want to see everyone, federally and provincially, buy into these improvements. Communication between the Provincial and Federal governments has got to be effective. I have worked Municipally for many years so I feel I know how the different levels of government work together. With that knowledge I feel I could be a conduit to facilitate discussions." With all of the high profile annexations happening around the County, John was asked how his potential departure from County Council would affect those long term discussions. He stated that, "I certainly don't act on my own for anything involving those discussions. All of Council are up to date on everything that is going on and things would carry on at the County as they have." On a personal level, winning the election as MP would inflict massive change into John's life. "If I win it will mean a lifestyle change," shared John. "I would be travelling a lot and spending time in Ottawa, but I'm not full time farming anymore so I can definitely do it." Even though it would mean that those long walks he was famous for taking around the "back 40" of his farm while working out a difficult problem would become few and far between. In the long run, in John's eyes, the benefits far outweigh any losses. "If I win the PC candidate nomination I will have to take a leave of absence from County Council in order to run for MP," stated John. "Ultimately I want to see Canada remain a country looked up to for leadership and common sense."